Wool is an effective mechanical filter media that removes fine particles and prevents other filter media from clogging. 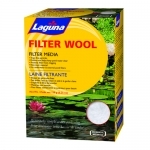 Filter wool contributes to polishing pond water and helps produce ultra clear conditions. Directions: Rinse the Filter Wool thoroughly before use. Note: To maintain biological filtration, do not change all filter media at the same time. Stagger filter media replacement to allow beneficial bacteria a chance to re-establish. Use water drawn from the pond to rinse established filter media. For optimum filtration, replace the Filter Wool monthly or sooner if necessary.